Schedule Your Free Cyber Security Assessment Today! New City Ohio is a real estate investment partnership with a long term focus on improving communities by providing desirable, safe, and affordable housing solutions. They specialize in funding the purchase and/or repair costs of single family rehab projects throughout Central Ohio. Local real estate investors who buy, fix, and sell single family homes trust New City Ohio as their ideal funding source. 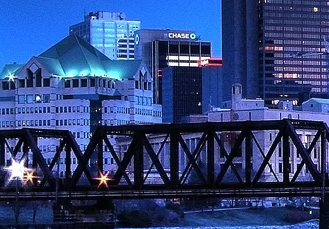 Like most organizations, New City Ohio’s growth outpaced their technology infrastructure leaving gaps which hampered productivity and led to inefficiency. In this case, the root cause stemmed from years of using multiple Internet Service Provider email offerings, both business and personal, as the foundation of their unified communications infrastructure. The diversity of infrastructure led to inconsistencies in branding, data duplication across both business and personal devices (i.e., workstations, laptops, smartphones), and a sole reliance upon individual user email clients to facilitate email communications. Working with Fortis Cyber Solutions, New City Ohio, was quickly able to standardize on a single Internet Service Provider and email host. Fortis Cyber Solutions created a single view of all email data for each end user within the New City Ohio environment regardless of legacy use. And by leveraging Microsoft 365, New City Ohio could now quickly share information using a collaborative set of tools, thus, saving time, money, and arming staff with more capacity to get more work done each day. Nothing is worse to an end user than experiencing an extremely slow device. Applications taking far too long to load, the constant hour glass icon, the anxiety that comes with not knowing if you have a virus, and let’s not forget the proverbial “blue screen of death”. Users a New City Ohio were experiencing these same symptoms before partnering with Fortis Cyber Solutions. With the Fortis Cyber Solutions team managing and administering their workstations, these issues have vanished. At the root, the issues were caused by a myriad of misconfigurations on their Microsoft Windows Server Domain Controller and the manufacturer hardware warranties expiring. With New City Ohio’s growing business model, they found themselves needing to give partners and customers access to the Internet and printing capabilities while visiting on premises. With the help of the Fortis Cyber Solutions Network Engineering team, New City Ohio was able to carve out room on their wireless network to accommodate this need. The solution isolates the network traffic of devices connected to a limited set of IP addresses and prioritizes this traffic lower than the traffic generated by the partners and employees. The thought is that while this service is made available, the quality and reliable of the service should not be more important than the bandwidth dedicated to business operations.